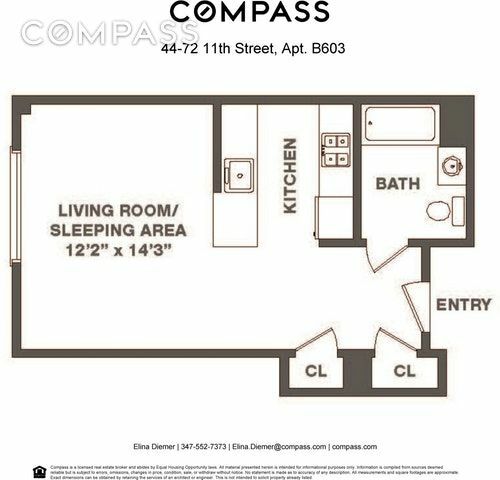 This bright layout will make a perfect home in prime Hunters Point, Long Island City. The spacious living room has an amazing view and you can breathe plenty of fresh air from these oversized windows. The modern kitchen features custom cabinets, a breakfast counter for more dining space and stainless steel appliances including dishwasher, gas stove and microwave. Bedroom can easily fit a king size bed and has large closet space. Tiled bathroom features a nice deep soaking tub with shower. About The building: 44-72 11th St is a classic building where you can enjoy the best of both worlds: spacious layouts and proximity to the city! The building features a fully equipped fitness center, bike storage, laundry rooms, package room, parking and a virtual doorman. The courtyard has a grill and amazing views of Manhattan. 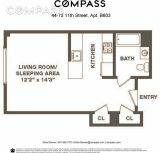 Photos are of model unit in the building.